The Palace Grill Catering Shop is a Family Business Where Quality Counts! This Catering Shop proudly caters the same delicious food from the famous Palace Grill restaurant in Chicago. The Palace Grill has been serving great food at affordable prices for 78 years. George Lemperis has owned and managed the Palace Grill for 35+ years! 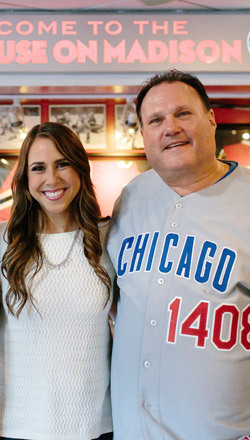 In 2012, George's daughter, Christina Lemperis graduated from the University of Illinois at Urbana/Champaign and joined the team to carry on the family tradition. In 2015 Christina started the Palace Grill Catering Shop, which guarantees the same mouth-watering food delivered right to your door! There is no better way to start your day than with a hearty Palace Grill meal. Craving a delicious breakfast before sitting behind your desk for hours? The Catering Shop can bring you our famous skillets! Looking to bring together coworkers for company brainstorming over lunch? Nothing gets the brain working better than our caprese skewers, mini kaiser rolls or our famous macaroni and cheese, which is made from a secret family recipe! Just ask the Chicago Blackhawks! The Hawks regularly cater our egg sandwiches — known as "heart stoppers" — before practice. Serving breakfast, lunch and dinner, the Catering Shop makes hungry people happy. From corporate events and holiday parties to birthday and graduations, the Catering Shop is here to help! If you have any questions about our catering services, please call Christina at (312) 226-9509. To learn more about Palace Grill Restaurant, see the Palace Grill website.